Difference Between Pleated, String Wound and Melt Blown Filter Cartridges? What is the Difference Between Pleated, String Wound and Melt Blown Filter Cartridges? 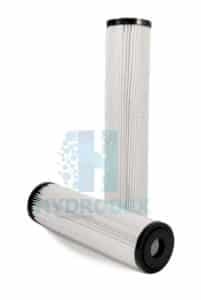 Each type of filter cartridges is acceptable for pretreatment to RO membranes. Pleated filter cartridge is typically used in higher purity applications such as pharmaceuticals and microelectronics. 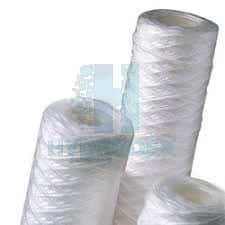 String wound filter cartridge is just as they sound; material such as polypropylene in string form which is wound around a central core. The disadvantage of these filter cartridges is that they suffer form particle unloading at higher pressure drops and require a slower velocity through them than other types of filter cartridges. Typically 2-3 gpm per 10 inch equivalent rather than 5 gpm per 10 inch equivalent for pleated and melt blown filter cartridges. The melt blown variety is thermally bonded polypropylene microfibers and is typically denser near the core than at the outside. 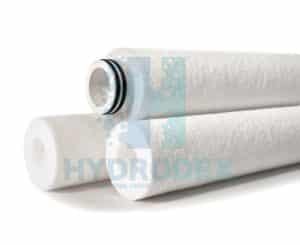 Read more about Hydrodex different types of filter cartridge.